Bernardo Vallarino is a Colombian-American mixed-media sculptor and installation artist heavily interested in geopolitical issues of violence and human suffering. He graduated with a BFA in sculpture from Texas Christian University and MFA in the same field from Texas Woman’s University. His recent solo exhibitions include his MFA Thesis Exhibition Un-Human at the Fort Worth Community Arts Center and Between Dying and Death at the Artes de la Rosa Gallery, both in Fort Worth, TX. Vallarino is a member of the Fort Worth Art Collective, and a regular contributor of its Spring Show and Fall Gallery Night. He also was a contributor of Ro2 Art’s CHAOS!!! show in 2016. Pedacitos de Paz is an installation featuring mounds of white commemorative ribbons inundating a small desk with a desktop magnifying glass. The purpose of this installation is to illustrate the duplicity of human’s attitudes towards peace and how violence cannot be stopped by the futile actions of thinking, wishing and praying. Conceptually, each commemorative ribbon represents any of those ephemeral actions that are incapable of real change. Due to this metaphor the artwork has the potential of filling almost any space. These ideas are communicated by inundating the space with an overwhelming number of ghostly lit ribbons. The sterile fluorescent light is emitted by the magnifying glass and works as a sort of insect attracting light beaconing to be looked through. The up close exploration of a few of these objects is essential, as it emphasizes the moot point of the ribbons. Pedacitos de Paz advocates for active participation of reducing at any level the violence that plagues our cities, our countries, and our world. 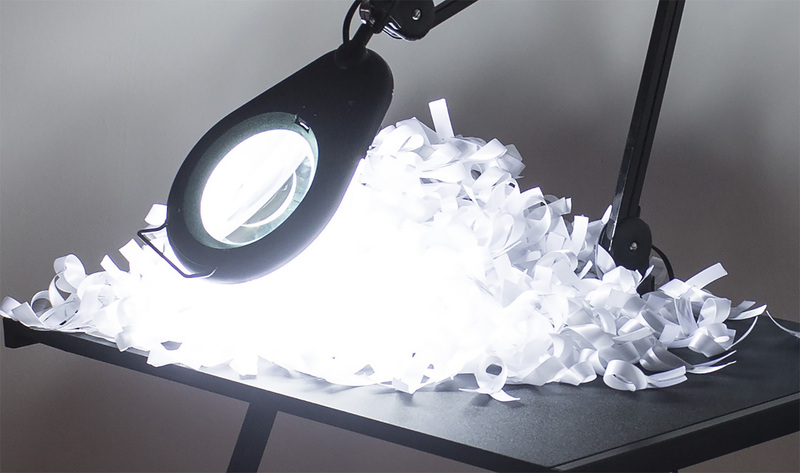 The work has only three components: a table, a large magnifying glass with a built in light and pin tied white ribbons. The magnifying glass is round approximately 10” in diameter and has a retractable metallic arm that attaches to the back of table. The table has a thin black top and modernistic “Z” metallic legs that mimic the shape of the magnifying glasses’ retractable arm. The ribbons are lapel size and tied with a pin in the usual commemorative form. The installation has thousands of these ribbons but the amount fluctuates depending on the space and whether or not is being installed among other sculptures. In the case of the project room at Ro2 Gallery enough ribbons will be installed to give a slight sense of claustrophobia. The whole installation is only lit by the white fluorescent light that emerges from the magnifying glass. ﻿Fort Worth Art Collective’s Fall gallery Night, Pop-Up Group Show, Fort Worth TX. Peripheral Visions Arts Fellowship Recepient and Foundations Prize Winner. FTW Arts Dealers Association Award for Excellence and Admirable Art. Mother-and-son partners Susan Roth Romans and Jordan Roth operate Ro2 Art, a contemporary fine art gallery in the Cedars neighborhood of Dallas, representing a diverse group of emerging, mid-career, and established artists, many with ties to the North Texas Region. The gallery regularly collaborates with organizations such as The McKinney Avenue Contemporary, Downtown Dallas Inc, and The Town of Addison, as well as maintaining a gallery program within the Magnolia Theatre at West Village. Ro2 Art has been named Dallas Observer's “Best Art Gallery” and was presented with the 2012 Obelisk Award for small business by the North Texas Business Council for the Arts. Ro2 Art is a proud member of CADD, the Contemporary Art Dealers of Dallas and recently exhibited for a third time at the 2016 Dallas Art Fair.